The women of DC COMICS are cunning, strong and the case of HARLEY QUINN™, just the right amount of unpredictable. Fighting against injustice and facing off against insurmountable odds is all in a day’s work for them. Now it’s time you start taking some inspiration from those amazing women when putting together the perfect business ensemble so you can do your day’s work in true Super Hero fashion. These DC Comics Modern Print Trousers bring you a look that’s powerful enough for any power meeting! 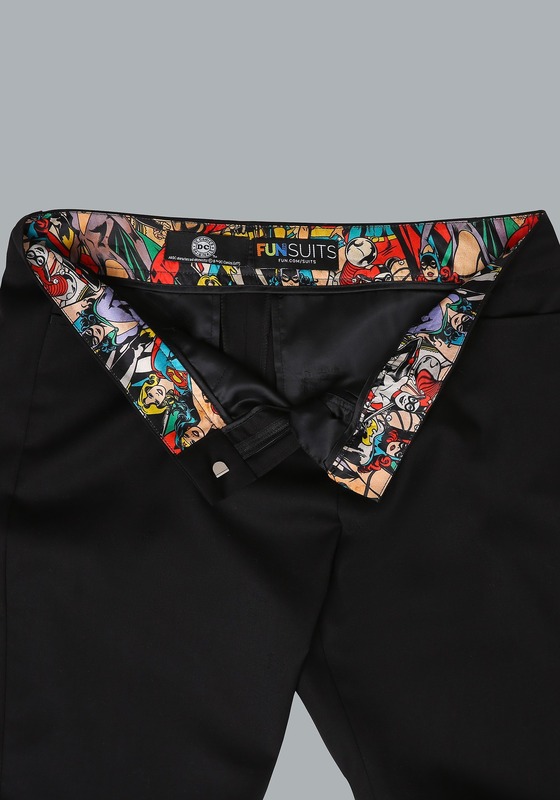 These exclusive FUNwear pants perfectly combine business casual style with the DC Super Heroes from your favorite comic books. The exterior is made of a polyester and rayon blend that pair perfectly with your business casual tops. Inside the waist is a repeating pattern featuring WONDER WOMAN™, BATGIRL™, SUPERGIRL™, CATWOMAN™ and Harley Quinn. Wear it with a blazer and you can be as confident as a DC Super Hero! Two front pockets; two rear welt pockets. Just surprised our daughter with these trousers and matching blazer today. We absolutely love them. They seem to be very well made and they look fantastic on her. She is so excited! I love fun.com's attention to sizing on each item so I can feel confident ordering online. Thank you for another great, highly recommended, product! We appreciate you taking the time to review these and can you be our mom so we get fun clothing from you too?